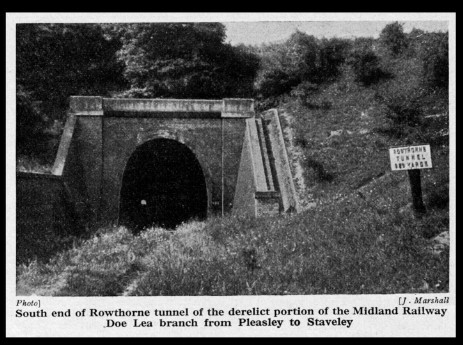 From an article in the Railway Magazine May 1941 from Philip Cousins. 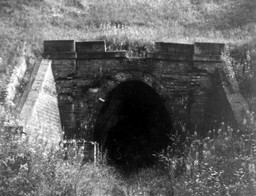 The tunnel to the north of the station running in to Glapwell colliery station it is 929 yards long and had two air shafts about half way along its length, in the fields along its length are two air shafts , at both ends of the tunnel were deep cuttings, at the south end little remains to suggest its existence. With the two air shafts to the tunnel it would appear then that the cutting of the tunnel would have been done using six working faces, one from each end and four others, two from each of the air shafts. Although the capping stones have been utilised as parking bollards in the car park at the start of the trail little remains of the tunnel. The tunnel was filled in and landscaped to form part of the Rowthorn Trail some time in the 1970’s but there are still several small reminders of the railway like rotting sleepers and telegraph pole stumps and some ironware from the rails themselves. 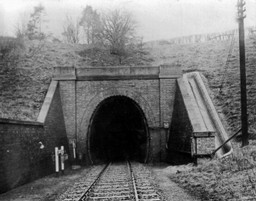 Mining subsidence was a major contributing factor to the closure of the tunnel and repair work was carried out on a regular basis when the tunnel was in use.